that’s what i did as well and worked for me. somehow the fastai folder got mixed up after running conda env update. Word to the wise - don’t do this with Windows 7 and probably not windows 8 either. Two days back I ran my model using fastai 0.7.0 on google colab. *"from fastai.transforms import ’ . the error is AttributeError: module ‘torch’ has no attribute ‘float32’. Also, old/fastai/… has all the necessary files it seems. Sorry for what is probably an obvious question to you, i am not very good at figuring this out. It’s very difficult for me to give much/any help to those who try this on windows, you guys really need to find someone who has windows access and knows it well to be of any guidance. 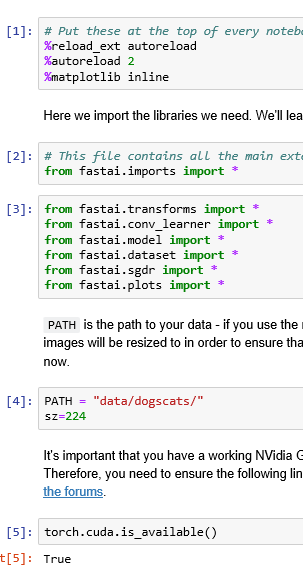 where you tell python explicitly where to find fastai. That’s if haven’t installed fastai and want to you use it directly from the clone. If you have installed it, then first check under those folders in sys.path and see whether the fastai folder is there physically. If it is then it should just work. But the correct solution is to figure out the windows symlinks, but I’m not your man for that. You need to look here instead. Thank you @stas, that fix solved it. Everything else seems to work now too. As you said though, this seems like the temporary hack to fix it but i am glad I know it does work. Now to try and figure out the symlink issue. Found GPU0 GeForce GTX 950M which is of cuda capability 5.0. PyTorch no longer supports this GPU because it is too old. hi there, just want to share my finding when running 0.7.0 on crestle. If you have only install fastai (0.7.0) without install torch (0.3.1) before, then it used to using torch 0.3.1 (automatically). but crestle has recently upgraded torch to 0.4.0, and most importantly, the related packages. 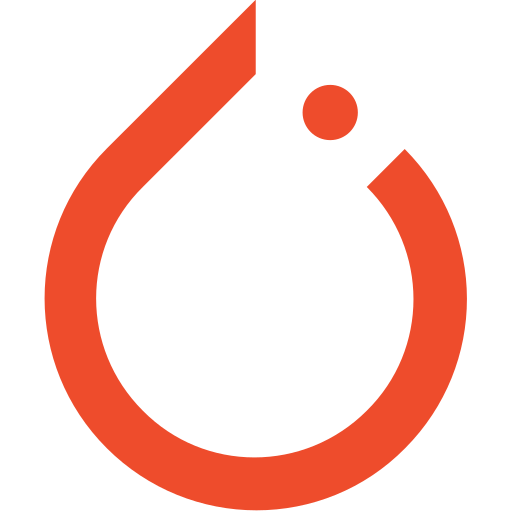 so you may need to install torch 0.3.1 and torchtext 0.2.3, if you didn’t install torch before. I am also having trouble starting with v0.7. I followed the instructions at the top of this thread for cpu. 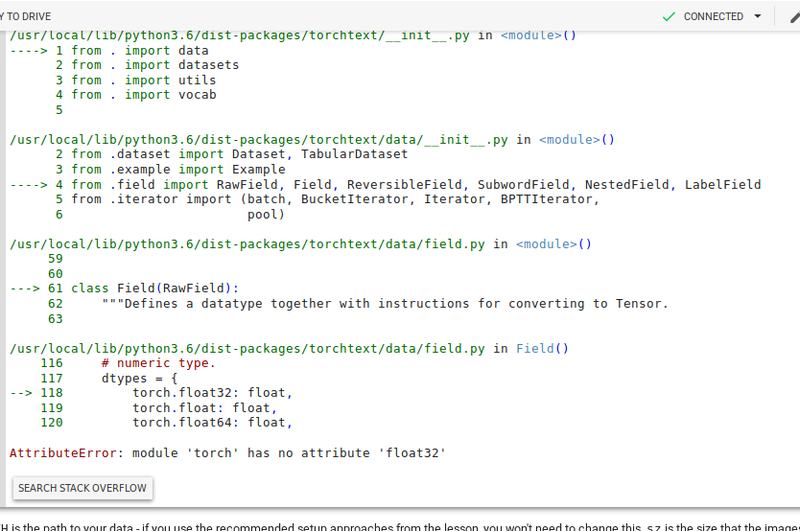 “** torchtext**” version was not compatible it has to be “torchtext==0.2.3.” for pytorch 0.3.1. I’m on 18.04, freshly installed. Installed fastai v1 first, in a dedicated env (it seems to work). Then I installed fastai 0.7 following the procedure described (which is the usual procedure). It was torchtext. Downgrade it to the previous version with pip. FYI, environment*.yml were just updated to pin torchtext=0.2.3. Thank you all for the input and testing. The symlinks look all right to me. Not sure what’s causing this. I am using clouderizer.com Fast.ai project template for the course and to run the template I use google colab like a backend and I am not able to import the library properly. I have already posted my query here and the solution I received was for the case when we run the complete notebook on google colab itself or I may not be able to understand it because these things are new to me. If someone in the forum is using clouderizer and has found a solution, please help!. Edit: Finally found a solution. 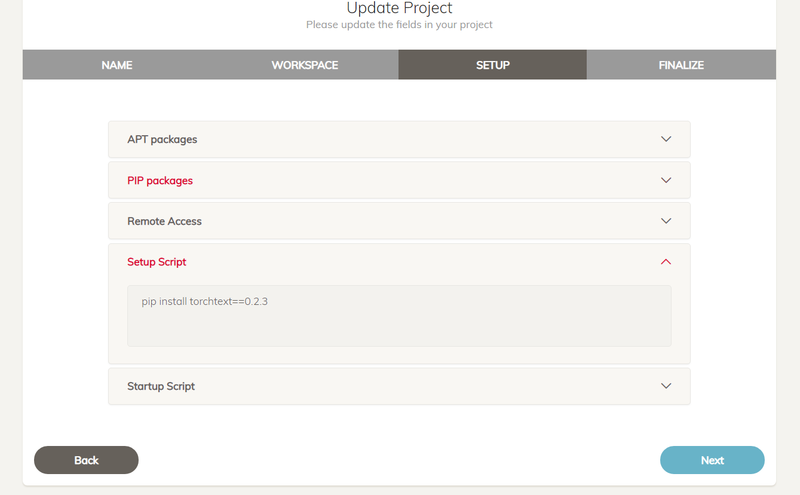 Click on edit project, go to the setup section, in the setup script column, add pip install torchtext==0.2.3. Now I am able to run the notebooks without any problem. I was getting error related to torchtext=0.2.3. FYI, environment*.yml were just updated to pin torchtext=0.2.3 . Thank you all for the input and testing. will that work with !pip install fastai==0.7.0 in kaggle kernels?